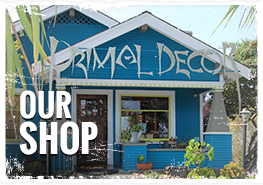 Primal Decor was established in 1995 by Jason Whitcomb. 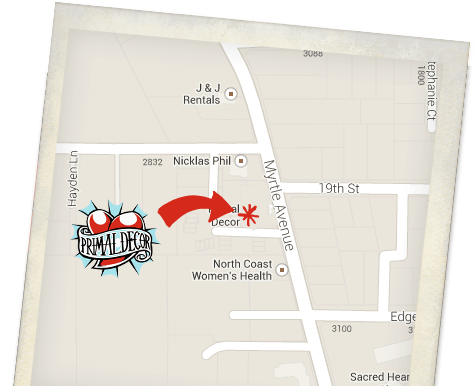 His mother was a chiropractor back in the day and Primal Decor was her old office. 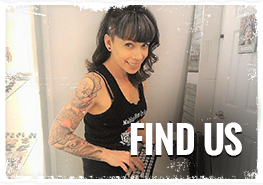 She retired from her chiropractic career and the building’s future was unknown until Jason, at the age of 18, decided he wanted to open a safe, open minded Body Art Studio. His mom was not convinced that that was how his college money should be spent. But if you’ve ever met Jason you would know he has some amazing persuasive skills. So it happened. The birth of Primal Decor. Back when pagers were the norm, hoops were your only option, and lower back tattoos and tribal arm bands were all the rage, Jason put himself through college with the money he generated from working at Primal and the local movie theater. Jennifer came into the picture in 1998 after a stint with thyroid cancer. She decided she didn’t want to be rich… She wanted to have fun. Jennifer left her corporate job with benefits and never looked back. I managed to spruce the place up.’ She says. ‘Out went the bachelor couches, burgundy carpet and in came paint, custom cabinets, much needed flare, and of course, Humboldt County’s first Association of Professional Piercers female piercer’. Jason and Jennifer lived in the back of Primal Décor for a couple of years. All the jewelry they owned fit on one wall. If you had asked us 18 years ago if our shop would carry high end gold jewelry and luxury brands like BVLA, Diablo, and Quetzalli we would have never believed you. We have been clients of Neometal , Anatometal and Industrial Strength Body Jewelry for over two decades. Currently we have a huge selection of breathtaking jewelry available in all price ranges. To this day, Primal Décor remains a place of pride for all of us that have worked so hard doing what we love. Luis Lopez has been with Primal almost since day one. He has worked hard to find a balance between his home life and his career. He’s a great team member at Primal but better yet, a great community member and dad here in Eureka, California. Dan Dozier came on in 2005. With nothing but an art book and tons of ambition, we saw huge potential in Dan. He has managed to turn his passion for art into an amazing career by combing amazing artwork with the human canvas for over 10 years. Needless to say he has been a great addition to the Primal Family. As for our wonderful Valente, he helps keep the shop going and is an amazing support staff for all of us. We would be lost without him and all his hard work. Valente worked 12-15 hour days for three days to help Jennifer remodel our piercing room into a beautiful hangout nook and bring you the awesome space you see today. While our staff has undergone many changes, with growth come new, smiling faces. Currently on our wonderful team we have Stephanie, Lauren, Karissa, and Xochitl. 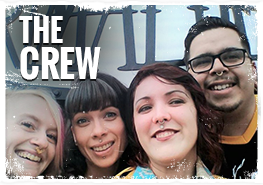 These women are great additions, keeping the shop running smoothly and supporting all of us while we fine tune the details around here. Xochitl has undertaken the task of our amazing piercer-to-be. These women are talented and full of moxie, with a strong will to succeed. Truly, we have tons of fun and we love what we do. And we are extremely grateful to all of our clients for keeping our days exciting and us motivated. Our goal has always been to create a safe, creative space for people to explore their more colorful side. While some things have changed, like the color of the walls, our mission is still the same: To be a safe, fun place for piercings and tattoos in our community. Our staff is always happy to help, and we plan on being around for the long haul. We are proud to be the oldest Body Art Studio in Humboldt County and have been owner operated since 1995. We are incredibly proud of our community support. Being rooted in such a special place requires commitment to that community. Primal partners with many non-profits to further the great work of generous humans. For instance, we work with organizations such as Breast Health Project, North Coast Children’s Services, Crabs Baseball, Humboldt Roller Derby, Teen Challenge, Multi Cultural Center, and Food for People. Thank You Humboldt for over 21 years of fun, hard work, and support! Cheers to another decade here in Humboldt, safely decorating bodies one piercing and one tattoo at a time.